Summer — the longer days of daylight and summer vacation often mean more time outdoors for many families. Never leave a child unattended in or near the water. This includes a bathtub or a small “kiddie” pool with just a few inches of water. At a public pool or at the beach, always stay close and supervise the child. 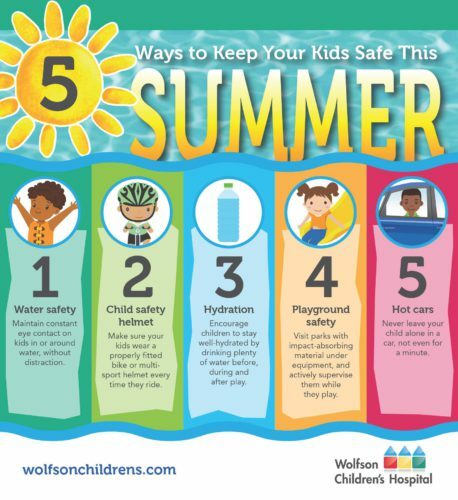 Drowning is the leading cause of death among children ages 1-4 in U.S. and Florida leads the nation in the numbers of children who die from drowning. Supervision is the top priority to keep children safe. Take precautions if you have a pool in your backyard or nearby by installing locks or fencing. Teach children how to swim and not to swim alone. Children should always wear a properly fitting helmet when riding a bicycle, tricycle, scooter or skateboard. Make sure the helmet is centered on the top of the head with the strap buckled and snug enough that it doesn’t rock back and forth. A helmet can reduce the risk of head injury. Drink plenty of fluids to prevent dehydration. For every 20 minutes of play, a child should drink about 10 gulps of water. Be on the lookout for dehydration warning signs, such as thirst, dry or sticky mouth, headache, muscle cramping, irritability, extreme fatigue, weakness, dizziness or decreased performance. Actively supervise children on playgrounds. Make sure the playgrounds have shock absorbing surfaces and are free of hazards and broken equipment. Avoid playgrounds with non-impact absorbing surfaces, such as asphalt, concrete, grass, dirt or gravel. Dress appropriately and avoid clothing that can get caught on equipment, such as scarves or drawstrings. When temperatures are warm outdoors, they will be even hotter inside of a closed car. Never leave a child unattended in a car, even for a few minutes. The heat is deadly and children are at a greater risk for heat stroke. Make sure car doors and the trunk are locked when the car is parked in the driveway or garage so that the child is not tempted to play in the car.